Time Out has published a special report about Barcelona: 20 things to do in the city. We'll share this information with you in five posts, starting today. One of the most famous boulevards in the world, La Rambla is worth a stroll d own even if you only have one day in Barcelona. A gateway to rural Catalonia, the mile-long road bustles with tourists, artists, human statues, fortune-tellers, dancers and musicians. Vibrant flower stalls, a cultural and exhibition centre, the superb La Boqueria market, a Joan Miró mosaic, newspaper kiosks and cafés line the street. You may pay a fortune to sip a cola at a roadside café, but the people-watching opportunities will be worth the price. In Barcelona, you can gaze in wonder at Gaudí's fairytale architecture. The Sag rada Familia is breathtaking and grotesque by turns. At first glance, it seems as though a careless giant has dripped melting wax over a Gothic cathedral, but a closer look reveals that the protuberances create a stone tapestry of Christ's life. Take the lift to the top for a breathtaking view. 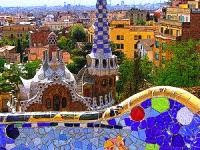 Park Güell is a magical place that emulates an English garden city. After seeing the gatehouses, based on designs for the opera Hansel and Gretel, you can walk up a splendid staircase, past a mosaic dragon to what once was a marketplace. Outside, climb to the heights of the park to gaze down at the magnificent panorama. Bikini. But there are also marvellous concert halls. The Gran Teatre del Liceu is a spl endid p lace, decorated by gold leaf, plush red carpets and ornate carvings. L'Auditori is a sleek 2,400-seater venue that covers not only classical but also jazz and world music. 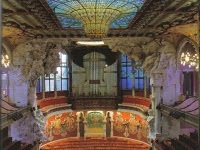 The Palau de la Música Catalana is celebrated for its Modernista architecture, and sheer volume of musical activity. There are a cluster of music events, like the Festival Internacional de Jazz de Barcelona. Picasso remembered Barcelona as beautiful and bright, a city wher e he spent his early years. Follow in the footsteps of the artistic genius by visiting the landmarks that shaped his youth. Stroll along the Calle Reina Christina and then cross over to 3 Carrer de la Mercè to see where his family lived, though the building was later destroyed. 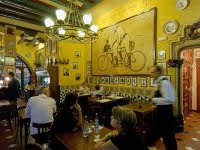 For a break, stop by the Els Quatre Gats, a café frequented by Catalonia's fin-de-siècle avant-garde. Then, head straight to the Museu Picasso , a gallery that records Picasso's formative years. 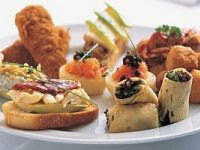 Picking on pintxos, platters of bite-sized food served on bre ad (a Basque version of tapas), is a popular culinary trend in Barcelona. Tradition calls for you to pick at the food with toothpicks, and at the end of the night you will be charged for the number of toothpicks that you have used. The Old Town Basque house Euskal Etxea invites you to savour dainty little croissants filled with jamón serano, chicken tempura with saffron mayonnaise, melted provolone with mango and ham, or a mini-brochette of pork and peppers. Have you been in Barcelona? What would be your "top 5" of things to do/see here?